Frae left tae richt: Luftwaffe preparin tae bomb Wieluń, SMS Schleswig-Holstein attackin the Westerplatte, Wehrmacht soldiers destroyin the Pols-German border post, German tank an airmored caur formation, German an Soviet truips shakin haunds follaein the invasion, Bombin o Warsaw. Pols territory dividit amang Germany, the Soviet Union, Lithuanie an Slovakie. Free Ceety o Danzig annexed bi Germany. The Invasion o Poland, an aa kent as the September Campaign, or the 1939 Defensive War in Poland (Pols: Kampania wrześniowa or Wojna obronna 1939 roku), an alternatively the Poland Campaign (German: Polenfeldzug) or Fall Weiss in Germany (Case White), wis a jynt invasion o Poland bi Nazi Germany, the Free Ceety o Danzig, the Soviet Union, an a smaw Slovak contingent, that merked the beginnin o Warld War II in Europe. ↑ Various soorces contradict each ither so the figurs quotit abuin should anly be taken as a rough indication o the strenth estimate. The maist common range differences an thair brackets are: German personnel 1,490,900 (offeecial figur o the Pols Meenistry o Foreign Affairs) – or 1,800,000. Pols tanks: 100–880, 100 is the nummer o modren tanks, while the 880 nummer includes aulder tanks frae the Warld War I era an tankettes. ↑ Soviet offeecial losses – figurs providit bi Krivosheev – are currently estimatit at 1,475 KIA or MIA presumed dead (Ukrainian Front – 972, Beloroushie Front – 503), an 2,383 WIA (Ukrainian Front – 1,741, Beloroushie Front – 642). The Soviets lost approximately 150 tanks in combat o which 43 as irrecoverable losses, while hunders mair suffered technical failurs. Houever, Roushie historian Igor Bunich estimates Soviet manpouer losses at 5,327 KIA or MIA wioot a trace an WIA. ↑ 2.0 2.1 2.2 Ministry of Foreign Affairs. The 1939 Campaign Polish Ministry of Foreign Affairs, 2005. ↑ 5.0 5.1 5.2 (in Roushie) Переслегин. Вторая мировая: война между реальностями.— М.:Яуза, Эксмо, 2006, с.22; Р. Э. Дюпюи, Т. Н. Дюпюи. Всемирная история войн.—С-П,М: АСТ, кн.4, с.93. 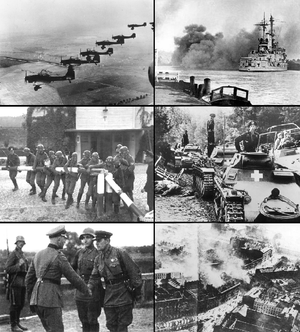 ↑ 9.0 9.1 "Polish War, German Losses". The Canberra Times. 13 October 1939. Retrieved 17 January 2009. ↑ 14.0 14.1 Bunich, Igor (1994). Operatsiia Groza, Ili, Oshibka V Tretem Znake: Istoricheskaia Khronika. VITA-OBLIK. p. 88. ISBN 5-85976-003-5. This page wis last eeditit on 25 Juin 2016, at 00:40.